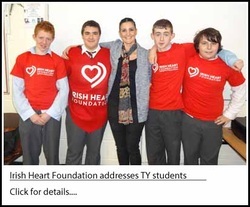 On Wednesday 24th April the Transition Year students of Kilkenny CBS received a visit from Ms Tracy Power of the Irish Heart Foundation. Ms. Power first explained to the audience just how common and widespread heart diseases such as strokes and heart attacks are in Ireland today. She revealed that in fact 10,000 people a year die from heart related illnesses. This alarming statistic is greater than the number of combined deaths caused by cancer, suicide and road fatalities. In effect heart related illnesses are the number one causes of death in Ireland. We were also informed of the measures necessary in order to prevent heart diseases happening and advised on how to achieve a healthy lifestyle. We were taught how to recognize when someone is having a stroke and instructed on how to offer them assistance as fast as possible. We were told about the large number of deathly chemicals inherent in cigarettes and that when a person stopped smoking for 20 minutes that they would immediately begin to notice an improvement in their breathing. Ms. Power elaborated further and we learned that after 5 years a person’s chances of developing heart disease would be halved and that after 10 years that same person would have the same chances of getting heart disease as a normal person. Finally we were informed that The Irish Heart Foundation raises all of its money from charity as they get no funds from the Irish Government. All such monies raised goes to helping victims and in order to raise awareness through public talks and advertising in the national media. Overall we found the visiting speaker Ms Tracy Power to be a very interesting and informative speaker and she left us with a lot to consider in respect of our own individual health and lifestyle.